1) 20 X 24 canvas painting signed by w. Chamberlin. 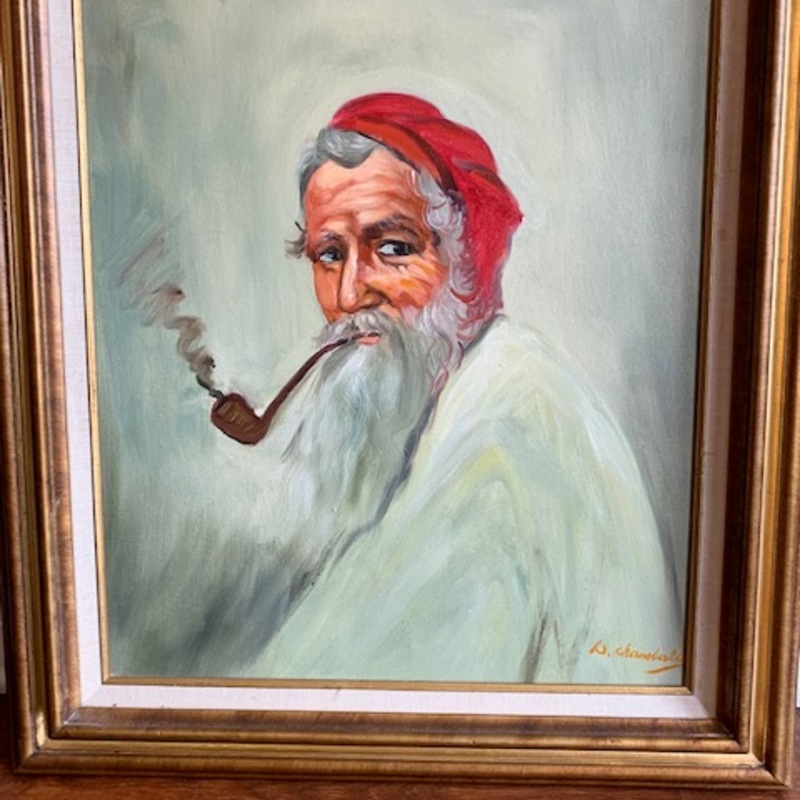 Old man with red scarf and pipe. Deceased Aunt's estate. She travelled overseas during her younger years and bought artwork and jewelry. Thank you for submitting your item for appraisal. This appears to be a chinese production line painting of recent production, late 20th century. It is a copy of an italian early 20th century genre painting, depicting an elderly fisher from Naples. The painting is sold lower right W.chamberlin with a lowercase "C", a mistake common among chinese painters from the so called "painting village" in Dafen China. Such paintings were sold in department stores or online for home decor purposes. The estimate is based on recent auction results for similar paintings. There is no measurement for the sentimentall value you might attach to the item. 20x16 framed painting on canvas in good condition. flowers, pitcher, grapes in a bowl, 2 pears, and a wine glass. 9 x 11 canvas painting by pourtless (signed). Canvass painting by pourtless (not signed). an old missionary building with a tree in front and trees in the background. Pourtless canvas painting of old missionary type building with tree standing in front and trees in the background. 20 x 16 painting on canvas of a winter scene including a stream and trees with mountains in the background. artist signature "antonio". Pourtless arts, palestine. missionary type building with a tree in front.